Since the original race in 1963, the Texas Water Safari has grown in size, not only in the number of participants, but also in its acclaim. While some participants enter only once, with a goal to finish, it is like an addiction for others that race year after year. 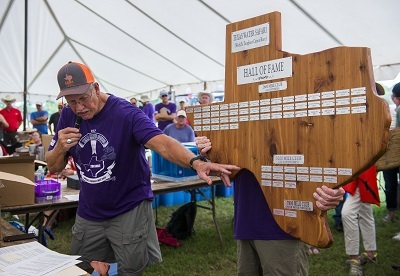 In recognition of each paddler’s dedication to the race, the TWS Board created the Texas Water Safari Hall of Fame in 2012. On the 50th anniversary of the race, membership was granted to all competitors that complete a minimum of 10 Texas Water Safaris. Oddly enough, 50 competitors had completed at least 10 safaris. The board also created three levels of recognition. A 2600-mile club for all those that had completed 10 to 19 finishes, a 5200-mile Club for those that had competed 20 to 29 safaris and a 7800 mile club for those that had completed 30 or more Safaris. Each year following the creation of the Hall of Fame new inductees are inducted when they attain 10, 20 or 30 finishes. Since the initiation of the Hall of Fame, 69 paddlers have been honored- . Some noteworthy accomplishments include John Bugge, who has completed 39 safaris and Pete Binion who has completed 25 in a row. A list of the Texas Water Safari inductees is listed below.